Sean’s approach to sculpture can be very spontaneous. Grasping the nearest thing to hand, a broken electrical appliance or a box of matches and superglue to quickly sketch a three dimensional idea. Equally a methodical approach is needed for his work in ceramics and bronze. Sean has developed a diverse knowledge of materials and processes from creating architectural columns, to snarling cats or figurative sculpture. However the vessel form is one that continues to generate his interest, recently switching from porcelain to bone china. 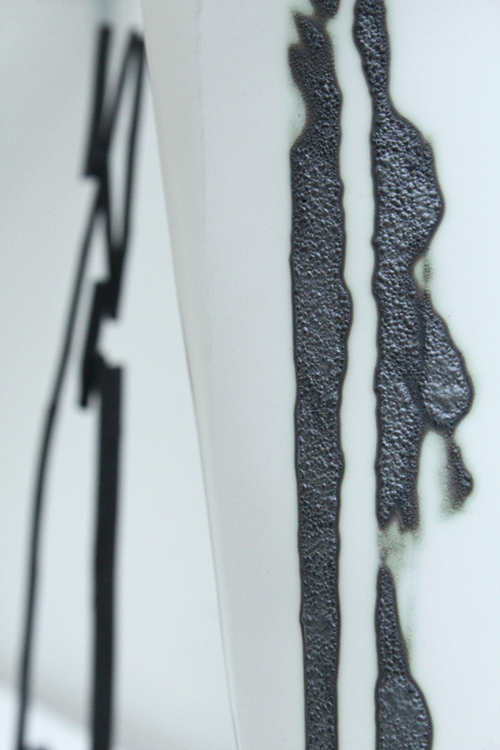 Sean off-sets the delicate white beauty of bone china with his jagged application of bold black copper oxide. The paper thin quality of the cast body begs for a scalpel to slice and collage new images onto its surface. This adds a sculptural dimension that becomes semi- translucent during the firing process and questions the boundaries of the vase. Returning to his figurative maquettes, Sean assigns their identity to the canvas of the vase. The vessels are crisp in their form or with ‘Galleon’, a billowing sail balance the angles and sharp lines. Grouped together they are reminiscent of the architecture of the city skyline. This echoes the displacement of identity felt when folklore and mysticism are set within the modern urban context.